Buon giorno and welcome to Stefano’s RomeCabs, Rome’s leading company for Rome Day Tours and Shore Excursions from Civitavecchia as well as Italy’s main cruise ports. 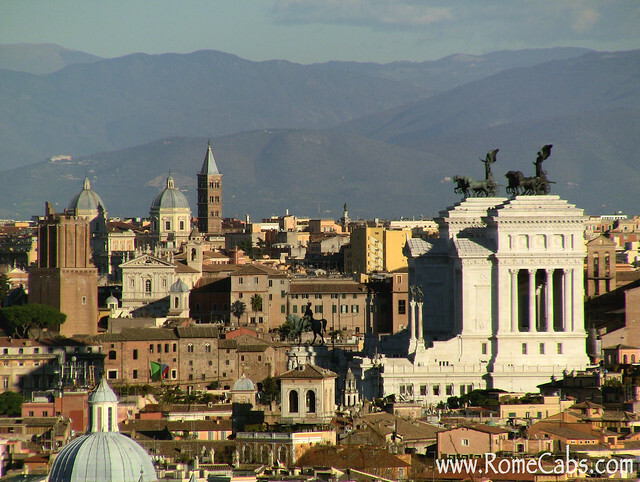 Rome is the most visited city in Italy by land travelers and cruisers who arrive by ship at the port of Civitavecchia. Rome was not built in a day, but you can sure enjoy the highlights in a day: stroll through the ancient Ruins, admire priceless ancient works of art in museums, enjoy lively squares, visit incredible churches, and delight in local Roman cuisine. Below are 10 of the most frequently asked questions about Rome Day Tours and Shore Excursions from Civitavecchia. 1 Which Rome tours includes the most popular highlights of Rome? Our Rome in A Day tour includes the most important highlights of Rome: a visit inside the Colosseum, Pantheon, Spanish Steps, Trevi Fountain and the Vatican (Vatican Museums, Sistine Chapel and St Peter’s Basilica). The tour is organized to make the most of your tour time and minimize wait times in security lines and driving time for a time efficient fun filled adventure in Rome! 2 Where do you recommend a Licensed Tour Guide on your Rome Tours? A licensed tour guide provides in-depth information about the awe inspiring works of art that surround you through every hall, gallery, and niche inside the Vatican. A licensed tour guide will make sure you don’t miss out on the “Must See” masterpieces. A Licensed Tour Guide will make sure you don’t get lost in the maze of multiple level halls and galleries that make up the Vatican Museums. A Licensed Tour Guide will guarantee you quick access to St Peter’s Basilica through the designated “Guided visitors” entrance inside the Sistine Chapel. The only other access to the Basilica is through St Peter’s Square with possible long security lines which may cause you to miss your opportunity to visit the famous basilica if you run out of time and have to return to your ship. If you have an interest in ancient Roman history and architecture, a Licensed Tour Guide also recommended can also be arranged for a Colosseum and Roman Forum combination tour. A tour guide will bring to life the ancient Ruins that are now a mere fraction of their former glory. You may request a tour guide for the Vatican and/or Colosseum with Roman Forum when booking our Rome tour. We will make all the necessary arrangements with a Local Licensed Tour Guide provided by My Rome Guides (a group of professionally licensed tour guides with extensive experience working with time sensitive day tours and shore excursions). 3 How can we skip ticket lines at the Colosseum and Roman Forum on your Rome tours? Ticket lines are notoriously long at the Colosseum and Vatican Museums if you don’t purchase your Admission Tickets in advance. You don’t need special “no line tickets”, just your standard Admission Tickets purchased in advance will suffice. Just be sure to bring your Ticket Vouchers with you so they will be converted into actual tickets on arrival. When you book your Rome Tours with Stefano’s RomeCabs, your confirmation email will also include detailed information about booking your Colosseum and Vatican Museum tickets in advance with the appropriate links. Just remember, once you book your tickets they are non-refundable for any reason. 4 What is a more leisurely and flexible Rome tour that avoids crowded places? All our tours include as many sites as possible to visit in a day for a fulfilling experience and enjoyment of Rome’s abundance of treasures. If crowded places like Colosseum and Vatican with pre-set visit times and advance purchased tickets are not your preference, we have a very popular Panoramic Rome Tour that is possible as a day tour from Rome, and a shore excursion from Civitavecchia. The tour includes a wide variety of popular places without visits inside the crowded Colosseum and Vatican, does not include attractions that require advance purchased tickets, and it’s very flexible for either a more slow paced tour, or the possibility to substitute sites as desired. The suggested itinerary is: Pantheon, Trevi Fountain, Spanish Steps, Piazza Navona, St Peter’s Square, View of Roman Forum from Capitoline Hill, Colosseum Square, Basilica of San Clemente with Underground visit. 5 Can we book a post cruise tour of Rome starting from Civitavecchia and ending at our Hotel in Rome? Certainly! Many cruisers end their cruise at Civitavecchia and enjoy a tour of Rome starting from their ship in the morning, and ending at their hotel in the afternoon. Your luggage travels with you locked in the luggage compartment of the vehicle so you don’t have to worry about luggage storage. The very popular Rome in a Day Tour is also offered as Post-Cruise Rome in A Day from Civitavecchia with convenient pick you right on the pier next to your ship, and at the end of the tour delivered right at your hotel. In fact, any full day shore excursion offered from Civitavecchia can be converted into a Post Cruise tour. Do you have an evening flight out of Rome? Staying a the Airport Hotel for a very early flight the next morning? No worries, you can still do the same tour with your drop off location at Fiumicino – at NO extra cost! 6 Can we book a short tour of Rome on our way to Civitavecchia? Most cruisers embark in the early afternoon and leave Civitavecchia by 5:00 PM. This leaves you with a morning free to enjoy more of Italy! If you haven’t yet visited Rome, you can enjoy a 4 hour morning tour of the Colosseum, Pantheon, Trevi Fountain and Spanish Steps, and then depart for your 1.5 hour journey to Civitavecchia to embark on your cruise. If you’ve already toured Rome and prefer a more relaxing tour, the Pre Cruise Countryside tour is sure to please. From Rome you will journey to the Roman Countryside to Bracciano, the medieval town along the shore of the pristine volcanic Lake Bracciano and visit the fairytale Renaissance Bracciano Castle. From there, you will be transported back in time a thousand years when you arrive at the medieval clifftop hamlet of Ceri for an unforgettable lunch at one of the local family owned restaurants that are famous throughout the region for their delicious homemade local Italian cuisine. After lunch, you will continue to Civitavecchia where your driver will take you directly to your ship. Our sister company Stefano Rome Tours also has a delightful countryside pre cruise tour that will take you to the enchanting medieval villages that dot Lake Bracciano: Bracciano with an optional visit to the Bracciano Castle, Anguillara, and Trevignano. 7 On a private tour will the driver drop us off close to the attractions we visit? Our Drivers and vehicles have access to enter Traffic Restricted Zones (ZTL) in the historic centers to minimize walking. Buses and large minibuses are restricted from accessing historic centers and even most cruise ports. Inside historic centers and near tourist attractions, local traffic and security measures dictate just how close a vehicle can stop (and wait) near main tourist attractions. As such, drivers will stop as close as lawfully as possible to the attractions you visit in our tours and wait for you with the vehicle while you sightsee so you enjoy more places in shorter time and minimize walking. 8 What happens if an attraction is closed on the Day of our tour? We offer our tours 365 days a year. However, on certain major holidays and certain days of the week some attractions are CLOSED. On Mondays, most museums and archaeological sites in Italy are also Closed. If your chosen tour falls on a day when one or more attractions are closed and you are not able to switch to a different tour date, you can substitute the closed attractions with other suitable places, or choose a different tour with an itinerary that does not include attractions closed on your date. 9 Do we tip the Driver, and our Tour Guide? While gratuities are not compulsory in Italy nor included in our tour rates, if you are pleased with the service you receive from your Driver and Tour Guide, 10-15% gratuity is customary in Italy. 10 Can we choose our own restaurant for lunch based on our dietary needs and preferences? Certainly. Our tours do not include lunch as we leave this culinary experience at our clients’ discretion. To make the most of your tour time, we suggest choosing a restaurant close to the attractions you will be at so you will not waste precious touring time driving long distance to a restaurant that may be quite out of the way. Whether you prefer a relaxed sit down lunch in either an upscale restaurant or a local trattoria, or wish to just have quick slice of pizza or a panini so can enjoy more time at the attractions you are visiting, your driver will be happy to offer you suggestions based on your preferences, area of Rome you will be during lunch time, and based on what our past clients have previously enjoyed. Thank you for visiting our Travel Blog and for choosing Stefano’s RomeCabs for your Day Tours from Rome and Shore Excursions from Italy’s main cruise ports. We invite you to browse through our website and find your ideal Day Tours and Shore Excursions. We also invite you to visit our sister company Stefano Rome Tours for a wider variety of Day Tours and Shore Excursions you will be sure to enjoy during your visit in Italy.